These computer printable signs are just what you need whether you use a laser printer, ink jet or simply hand write your sign cards. Preprinted cards are made of uncoated card stock. Fluorescent cards are real eye-catchers for all of your high traffic areas. 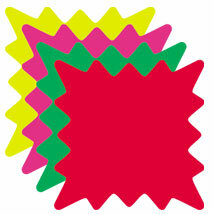 Sold in rainbow packs of 100 and include 25 sheets of red, yellow, green and magenta.